The Wizard of Odds: SEC Supremacy: Myth or Reality? SEC Supremacy: Myth or Reality? Alabama won its bowl game — some would call it the toilet bowl in Shreveport — but consider the opponent was Colorado, which finished 6-7. Other postseason victories for Southeastern Conference teams have come against Central Florida, a Hawaii team that didn't belong on a grand stage and a severely shorthanded Florida State. The only notable victories were against Clemson and Wisconsin. "This postseason has already shed light on the absurdity of the SEC supremacy claim. Michigan, a team victimized by I-AA Appalachian State at home, shocked defending champion Florida, 41-35, in the Capital One Bowl. The Wolverines, playing with a lame-duck coaching staff, so thoroughly dominated the Gators that they even overcame four turnovers. "The Big Ten, much maligned recently for being big and slow, actually has a winning record against the SEC in the BCS Era (since 1998), at 14-12, with Ohio State-LSU in the BCS title game pending. Michigan is a sterling 5-1 during that period while OSU is the source of the Big Ten's consternation, going 0-3 in that time and 0-8 all-time." What a flimsy argument. What does it say about the Big 10 that the "team victimized by I-AA Appalachian State at home" was 2nd in the Big 10? Hawaii and Central Florida were both their conference champions. Central Florida (who was favored in the game) was beaten by Mississippi State, which is not a top team in the SEC. How does that perpetuate a myth? I can see attacking the SEC if it was 2-6 so far in the bowls, but it's 6-2. 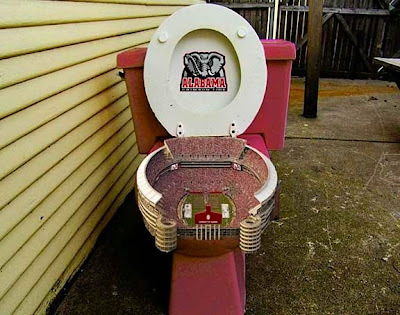 I don't believe the SEC is as superior as some do, but crapping on them for going 6-2 so far is idiotic. this is laughable, but whatever helps you sleep at night wiz. I wouldn't be so dismissive of the SEC's bowl wins over Hawaii and UCF -- those teams averaged 38 and 46 points, respectively, in the regular season, but were held to 3 and 10 in their bowls. Mississippi State, in particular, was picked to win by absolutely nobody but just plain crushed the Knights' offense and held the nation's leading rusher in check for his second-lowest yardage of the season. Florida and Arkansas let the conference down big-time, but that shouldn't detract from what the other teams accomplished. I think the truth lies somewhere n the middle. I'd just like to see (like everyone else) the SEC start playing more teams out of conference that are worth a damn. don't come back with your token one or two games. a couple of temas from the SEC didn't even play a BCS conference team. i dare one of you guys to say I don't know what i'm talking about!! prove me wrong, if you do. "don't come back with your token one or two games"? So basically you're asking SEC fans for examples of tough OOC games, but in the same breath you're pre-emptively dismissing them. Let's look at the top teams in the SEC: LSU played (and destroyed) Virginia Tech, who's playing in a BCS game tonight. Georgia played Oklahoma State. Tennessee went all the way across the country to play a Cal team that was pretty good before they packed it in about halfway through the season. What have the other top teams done that's so special? Ohio State's one non-conference BCS opponent was Washington. Oklahoma's was Miami (the worst Hurricane team in more than a decade). Kansas played NOBODY. I'll give Southern Cal some credit for having Nebraska and Notre Dame on their schedule, but neither of those teams amounted to a damn this season. Yeah, the SEC's rep for easy scheduling is not entirely undeserved, but let's don't act like we're that much worse about it than other conferences. I thought you were done with the SEC hatred but I guess not. I just want to let you know that you've just lost a regular. didnt realize Okie St was a world beater ... considering they lost to Troy!! Cal was worse than Okie St. its ho you finih the seaosn bud. it is obvious the pundits had Cal-berk over-rated. you gave me the 1 token in LSU/VaTech. prolly one more out there ... for your conferences sake lets hope so! can't stand the heat, get out of the kitchen. your conscience hasn't gotten the best of ya. I guess you just received your 5th foul. aaaaaaaaaaaahhhhhhhhhhh c ya!